A total of 167 000 children under the age of five die in Uganda annually, a situation analysis conducted by the Ministry of Gender, Labour and Social Development has revealed. The analysis also shows that over 56 per cent of the population is below the age of 18 and more than 78 per cent are under the age of 35. It was presented during the Northern Regional Child Forum organized by the Gender ministry in partnership with the United Nations Children Education Fund (UNICEF) in Gulu District recently. Held under the theme: “Our Children, Our Future” the forum aimed at calling for action on some of the policy priority areas that affect the wellbeing of the Ugandan child. The analysis also revealed that malnutrition is a major cause of death in 40% of children in the country. It further noted that there is great disparity between children living in rural and their counterparts in the urban areas. Children living in rural Uganda are three times more likely to live in extreme poverty than those in urban areas. “Children aged 0-8 years are particularly vulnerable, especially if they live in the rural north of the country or are from poor families and, even more so, if they live in female headed households or are orphaned or disabled. Adolescent girls are particularly vulnerable because they are most likely to be poor, marry early and miss out on secondary education,” reads part of the analysis. Gulu Resident District Commissioner Santos Okot Lapolo said government needs to implement the existing child laws that protect children’s wellbeing in Uganda. Lapolo said priority areas should focus on the wellbeing of the child, adding that commitment to the set laws and policies under review will enable children contribute to the country’s socio-economic transformation. “I expect commitment from government, donors and civil society organisations committed to addressing the plight of children,” he said. Lapolo said the ever increasing juvenile offenders and street children is a time bomb for the country. “In villages, the girl-child is most vulnerable to the extent that she is looked at as a sure million and in case of defilement, parents prefer to negotiate out of court. So the concept of protecting children is still low in our country,” he added. 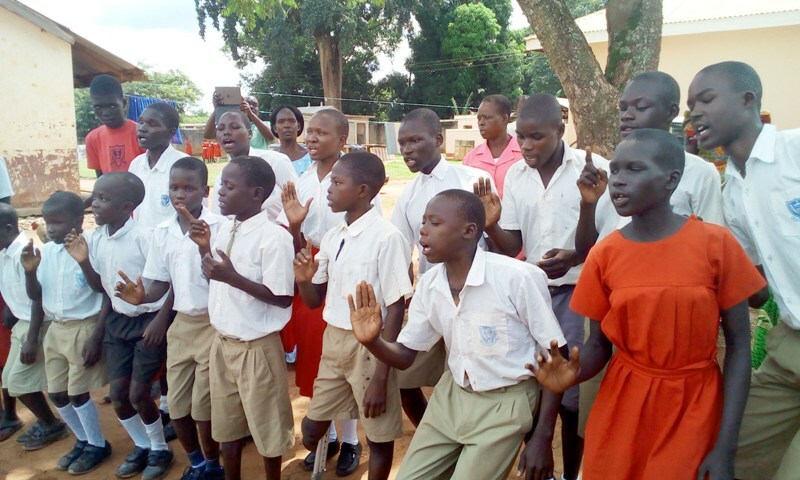 Blind children of Gulu Primary School recite a poem about the plight of a blind child. He urged the Gender ministry to increase budgetary allocation to lower local governments to enable them handle children affairs in the country. James Kaboogoza Sembatya, the assistant commissioner in charge of children affairs in the Ministry of Gender Labour and Social Development, said districts have to reschedule their planning and strategies to be able to address challenges that come with child protection. In Uganda, the probation and community development officers are responsible for child affairs at district and sub-county levels. However, during the child forum, concerns were raised about the meager funding to the department. “We want the districts to change their way of planning and the way they look at children within their region. The biggest issue coming out is the little resources to fund the child protection and care,” Kabogoza said. Ten years down the road, the regional Child forum seeks to identify key priority areas that will inform the formation of the National Child Policy under consultative stage to have a law that covers all children in the Uganda. With about 2.4 million under-five stunted and more than I million under weight, it is estimated that Uganda loses 3 per cent of its GDP annually to malnutrition. Despite being the country’s food basket, the South West region has the highest rates of stunting, illustrating that the causes are not limited to low income and food insecurity.